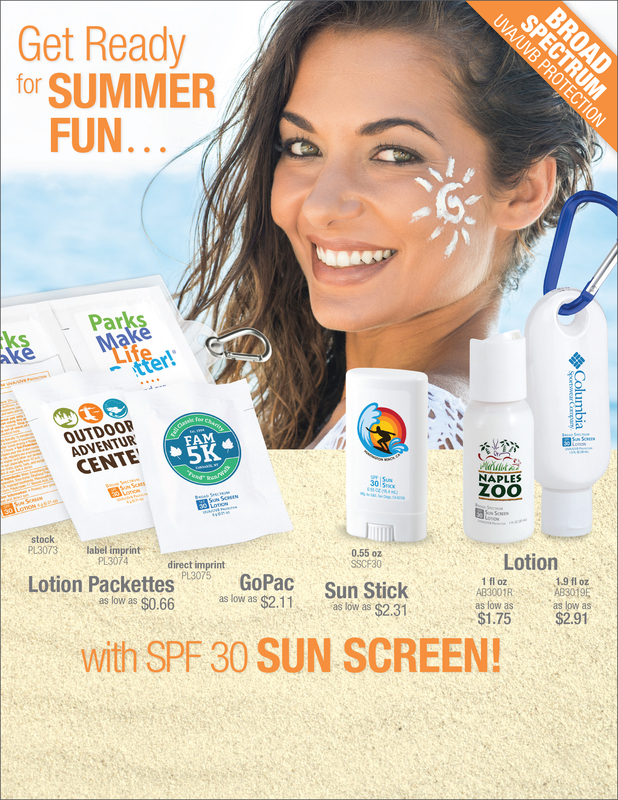 Promote your brand and prevent skin damage from the sun's burning rays with SPF 30 Sun Screen lotion. This broad-spectrum sun screen protects against both UVA and UVB rays and is ideal for outdoor activities. Label imprint option is on white over-label. Direct imprint is on packette. 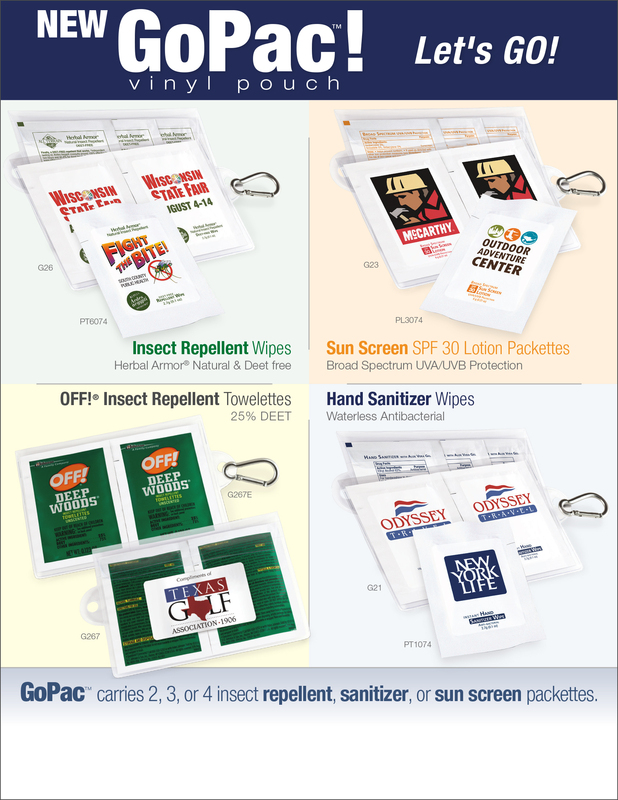 Add the new clear vinyl GoPac™ pouch to clip on and carry multiple packettes! Envelope style flap secures under clear strap. Ingredients panel imprint on back is orange. Any change requires additional set-up. 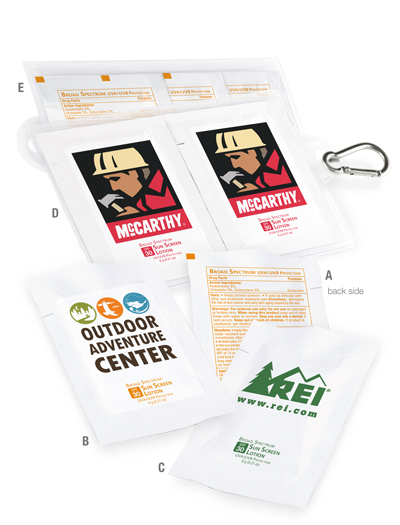 1-4 color process imprint on white label. Only one set-up charge per 1-4 color process design: $50 (v). PMS matches are not exact, but are close approximates. Direct imprint on white packette. One set-up charge per color: $50 (v). PMS matches are not exact, but are close approximates. Single: 100 units/19 lbs per box. Box size: 18 x 12 x 5 inches. 2-Pac: 250 units/12 lbs per box. Water, Emulsifying Wax, Stearic Acid, Coconut Oil, Propanediol, Shea Butter, Ethylhexyl Palmitate, Vitamin E, Sunflower Seed Oil, Isopropyl Isostearate, Phenoxyethanol, Polyacrylate-15, Xanthan Gum, Polyacrylate-17, Benzoic Acid, Dehydroacetic Acid.